Add a point or two to the score if 'extreme' is your scene, but otherwise check the audio demos first. Randomisers. Highly complex. Clear interface. Hard to program. Not at all versatile. Results can be unusably extreme. Little sonic variety. Glitchmachines is known for its extreme-sounding plugins, and its latest is no exception. 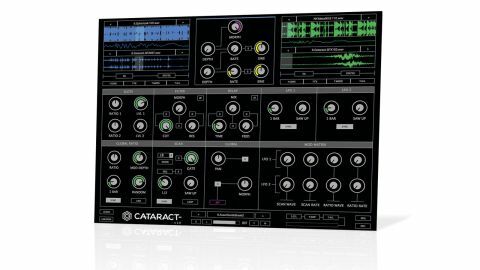 Cataract (VST/AU) is described by the developer as a "segment multiplexer". It loads as a virtual instrument but you don't actually play it; rather, it plays back non-contiguous sections of loaded samples in sequence to generate evolving loops. This is backed up by two sample libraries (134 percussive loops and 200 FX), but you can load in any audio you like. At the heart of Cataract are a pair of "scanner" modules. These are essentially sample playback engines (for anything from one-shots to full tracks), each containing two sample slots. "It's all controlled by a dedicated LFO for each scanner module, the position of which determines the segment to be played"
At their simplest, the scanners act by playing a user-definable number of sections of a sample, of a user-definable length, at a user-definable speed, in random or user-defined order. It's all controlled by a dedicated LFO for each scanner module, the position of which determines the segment to be played at any given time - so different waveforms trigger wildly different segment playback orders/sequences. At the most basic level, a scanner plays a bit of a loaded sample, jumps to another point in the sample, plays that bit, and so on; then, when it's played the defined number of segments, it begins again. At random LFO settings, the playback order and modulation will change with each cycle. The two samples in each scanner can be blended or morphed between, as can the outputs of the two scanners themselves. The many options for tweaking and modulating the scanning include a 16-step sequencer (assignable to any parameter in Cataract but defaulting to the main scanning ratio), three-band EQ, a multimode filter, dual LFOs and a delay module. On top of that, there are patch randomisation options, and a morphing section for blending the signals from the various sample slots and scanners, as well as modulating those blends. We don't have room to detail the full extent of Cataract's interactions and modulations here - as a demonstration of the audio mangling potential of contemporary software, it's immense. But that's the problem: almost every one of the processes Cataract offers generates a fairly extreme result on its own, so stacking them up usually renders results so bonkers as to be basically unusable for anything except very 'digital'-sounding textures. You can, of course, use it at a less involved level for simple effects (rhythmic stuttering, etc) but in that area it faces plenty of competition and could be reasonably considered overkill. We have a few feature requests, too: MIDI note triggering of the playback engine, MP3 import and the ability to quickly export one-, two-, four-, and eight-bar loops as audio. However, Cataract does boast some nifty touches, like drag and drop of samples, copy and paste between scanner slots, and a fairly large (though quite samey) preset library. The section colour coding does a good job of clarifying the complex interactions going on within the plugin, and there's a handy optional info overlay. Ultimately, Cataract is an incredibly powerful and esoteric instrument that (in descending order of relevance) complex preset programmers, sound designers, techno producers and vocal remixers might consider giving a whirl at this price.